Tennessee lead the nation with over 1,000,000 volunteers in the Great American Clean Up this year. Isn’t it great to be a Volunteer from Tennessee? Here’s a story from the Associated Press about cracking down on illegal dumping in New Mexico. Of course this problem is nationwide. I’ll be at a Keeping America Beautiful affliates conference in Atlanta the rest of the week. I’ll blog as much as possible. As Sun cleans the trash from his family’s watchtower, he spies a glint of metal on the ground. It’s a set of car keys: the black leather ring is imprinted with the word “Audi.” Under normal circumstances, Sun would hurry down the mountain to deliver the keys to their owners. This time, however, he’ll wait for the culprits to hike back up, looking for the keys—and then deliver a stern lecture about showing proper respect for China’s greatest cultural monument. Flashing a mischievous smile, he slides the keys into the pocket of his Mao jacket. It’s one small victory over the barbarians at the gate. While I read the physical magazine, you can read the entire article online at http://www.smithsonianmag.com/people-places/great-wall.html. Since I have done very little world travel, I always thought that littering was an American thing. While the Chinese have banned plastic bags, like us, they have a long way to go. The Earth Is Not a Trash Can at Kasha-Katuwe. I can’t express how lovely and clean this place is. There are no plastic bottles along the trails, nor plastic bags hanging from its majestic rocks. 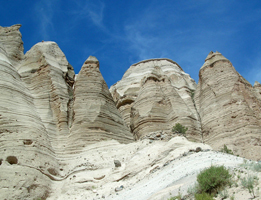 Thanks to the Pueblo de Cochiti, the University of New Mexico and Sandoval County, NM, for maintaining its beauty. When we entered this sacred place and paid our $5 fee, the native American who met us gave us many rules to follow. At first, I was offended that he thought that we would leave plastic bottles along the trail. After the spiritual journey we spent there in the rocks, I was glad that he was adamant about respecting the land and the animals in the area. Tonight as I walked around my neighborhood, I picked up 5 plastic bottles that had been left along the sidewalks, roads and playgrounds. While my neighborhood is not a geological wonder as Kasha-Katuwe, it is beautiful with its undeveloped rolling hills surrounding it and lush greenery. I wish everyone was as stern about the environment as the greeter at the Tent Rocks National Monument. We revisited the site of the storm drain trash yesterday in Albuquerque. The garbage had been removed. I was glad to know that Albuquerque is quick to clean up trash sites. All in all, the Albuquerque and Santa Fe areas were very clean. We visited the Tent Rocks National Monument on Friday and didn’t see a single piece of litter on both trails we climbed. Along Interstate 25 heading south from Santa Fe to Albuquerque, we noticed plastic bags hanging on fences along the various Indian Reservation lands. In Tennessee, the plastic bags hang from trees. It’s time for all Americans to realize that we live in a beautifully diverse landscape. We need to keep it clean. When I visit west of the Mississippi, I realize that we took over the land from the native Americans, who were alread y living here. As a child, I was taught that the Indians were savages. The Indians were uncivilized. If someone with different cultural habits moved into my house uninvited, I would ask them to leave, too, and would use physical force if necessary. I always leave the West with regret that we destroyed the native American lifestyle. I feel that they were one with the earth and understood better that humans are part of earth. We saw a tee-shirt in the Albuquerque and Santa Fe gift shops. 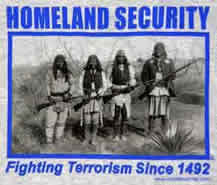 There was a photo of four Indians with guns with the caption, Homeland Security: Fighting Terrorism Since 1492. At least, it wasn’t a plastic cup. The coffee in the bottom appeared to be just dry. I hope the person who left it comes back for it. *Thanks to the Nature Conservancy for saving this land from housing development. One thing I don’t like about traveling is that I use more plastic products that I would at home. I drink bottled water as we hike a lot. I always take the empty plastic bottles to a recycling area or put them into a trash can if no other arrangements can be made. I don’t use my Sigg water bottle because I can’t carry enough water in it for a day hike. I also use the hotel plastic bags for dirty laundry. Of course, once I’m home, I use the bags for trash and dispose of them properly. 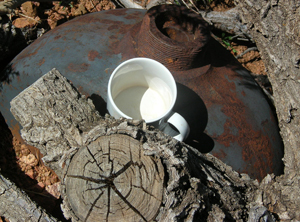 We still keep the place we are visiting as pristine as we found it or better. Using bad products as plastic bottled water is no excuse for littering.